This PA-9 Upper is designed to work with all Palmetto State Armory 9mm Lower Receivers which accept Glock-Style Magazines. Barrel: 10.5" chrome moly steel barrel. Chambered in 9mm, (9x19), with a 1/10 twist. The barrel is nitride treated for durability and finished off with a Palmetto State Armory 9" Lightweight M-lok free-float rail and a 9mm birdcage flash hider. Bolt Carrier Group: G-9 9mm BCG. Nitride treated, 8620 steel, G-9 Bolt allows use with Glock®-style magazine Palmetto State Armory lowers. Includes charging handle. To be used with Palmetto State Armory 9mm lowers that use Glock®-style magazines. Will this work with other brand AR 9mm lowers or regular AR lowers with a conversion insert? i think the Colt/Glock issue is specific to the lower, and not the receiver itself. What is the difference between this G-9 BCG and the G-3 BCG? Also the Hybrid BCG. Which is the newest? BEST ANSWER: Think the G-3 is PSA's earlier version. The G-9 is in addition to or has replaced the G-3. G-9 works with Glock mags only. G-9 Hybrid works with Glock and/or Colt mags. Typical PSA Bang for the Buck! Man, it's never good to have extra lowers laying around - but it's FUN. Grabbed this upper with free shipping. What I got was a forged upper and a G-9 Hybrid, not the billet and G-9 BCG. I'm fine with it, would have liked the smooth side, but the hybrid was a bonus! Took everything apart, cleaned and lubed, handguard nut was properly torqued, muzzle device properly timed, gas key properly staked. 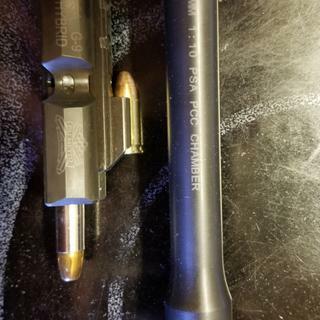 But, the upper to barrel fitment is looser than Stormy Daniels... Trued the upper and bed the barrel with Permatex 24300. Going on a plain 'ol pistol lower using Mean Arms EndoMag PMAGs, zero, ziltch, Nada mag block required!